Please note that as of Squiz Matrix v5.1.0, the assets and features described in this chapter have been deprecated. The UTransact Payment Gateway allows you to use ubiquity's uTransact Online Payments Platform as a payment gateway for your e-commerce system. In order to use the UTransact Payment Gateway, you will need a uTransact account. For more information, refer to the uTransact website. uTransact online payment gateway and eCommerce solutions are only available to users within New Zealand. Once you have added a UTransact Payment Gateway, you can configure its settings on its associated asset screens. The majority of these screens are the same or similar to those for a Standard Page and are described in the Asset Screens manual. In this chapter, we will describe the Details and DisplayFormatting screens, which are different for a UTransact Payment Gateway. 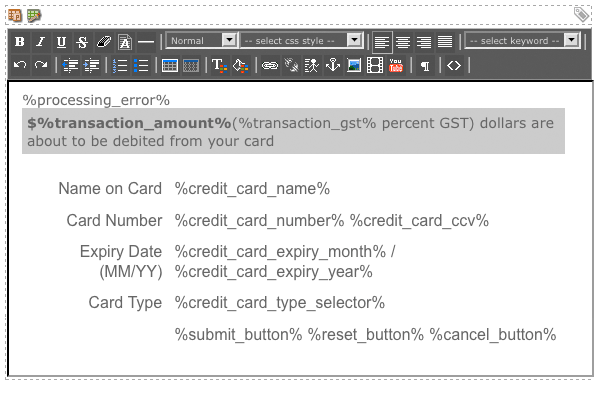 When you create a UTransact Payment Gateway, the Display Format Bodycopy asset is automatically created beneath it, as shown in the figure to the right. You can use this Bodycopy to define the contents and layout of the UTransact Payment Gateway form. This Bodycopy can also be accessed via the Display Formatting screen. The Details screen allows you to configure the settings of the UTransact Payment Gateway. For more information on the Status, Future Status, Thumbnail and Details sections, refer to the Details Screen chapter in the Asset Screens manual. This section allows you to enter your uTransact account details, allowing you to accept payments from the payment gateway. For more information on obtaining a uTransact account, refer to the uTransact website. The UTransact Account Details section of the Details screen is shown in the figure below. The fields available in this section are described below. The information required for these fields are obtained from uTransact when you create your account. For more information, refer to the uTransact website. Utransact Bgas URL: enter your uTransact Bgas URL. Utransact Transactions URL: enter your uTransact Transactions URL. Utransact Services URL: enter your uTransact Services URL. Username: enter your uTransact account Username. Password: enter your uTransact account Password. Merchant ID: enter your uTransact Merchant ID. Payment Model: enter your uTransact Payment Model. This section allows you to use the Card Verification Value (CV2) system as added security for credit and debit card transactions made on the UTransact Payment Gateway. The Card Verification 2 code property (CV2) section of the Details screen is shown in the figure below. In the CV2 Verification field, select whether or not to use CV2 checking on the payment gateway. If this field is set to yes, the CV2 field will be displayed on the UTransact Payment Gateway page, as shown in the figure to the right. This section allows you to source name and address information from the user's e-commerce form responses for payment processing on the gateway. This information is stored during the payment and can be used for security purposes (such as address verification) enabled on your uTransact account. The Purchaser Checkout Form Question Map section of the Details screen is shown in the figure below. First name question: select the Ecommerce Form Question to source the purchaser's first name from. This field is mandatory. Surname question: select the Ecommerce Form Question to source the purchaser's surname from. This field is mandatory. Email question : select the Ecommerce Form Question to source the purchaser's email address from. Address line 1 question : select the Ecommerce Form Question to source the first line of the purchaser's address from. This field is mandatory. Address line 2 question : select the Ecommerce Form Question to source the second line of the purchaser's address from. Suburb question: select the Ecommerce Form Question to source the suburb the purchaser lives in from. City question: select the Ecommerce Form Question to source the city the purchaser lives in from. Postcode question: select the Ecommerce Form Question to source the purchaser's postcode from. This section allows you to change the wording of the buttons for the payment gateway. The Interface Options section of the Details screen is shown in the figure below. The Display Format Bodycopy is used to define the layout of the UTransact Payment Gateway page. The default layout of the payment gateway is shown in the figure below. To change the information that is being shown, click on the icon - the WYSIWYG Editor will appear, where you can use keyword replacements and formatting to set the layout of the information to show on the payment gateway page. By default, the information shown in the figure below will appear in the WYSIWYG Editor.